FICEP was the first firm to address the conservation of shop floor space in fabricating plants around the world while at the same time enhancing the productivity. Prior to FICEP’s innovation of combining multiple machines into one production cell, the traditional system layout was much different. The old approach was to separate, for example, the drill and the saw or drill and coper with multiple transfer tables and conveyors. The required footprint of such a system required at times over 120 meters (400 ft). of shop space depending upon the number of work stations plus double the width. 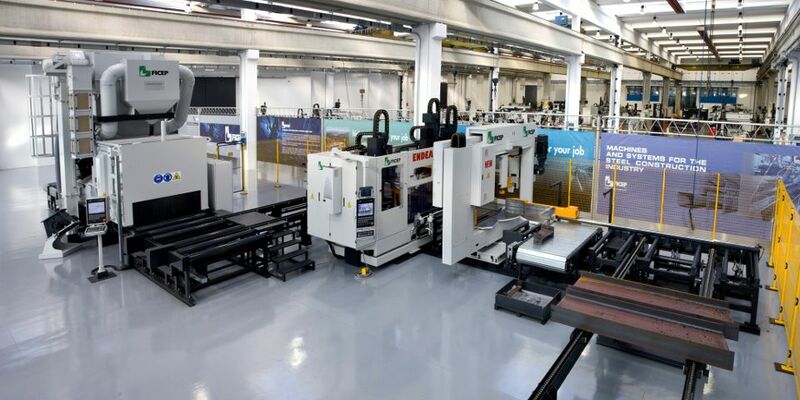 In addition to this extensive commitment to shop space, the system required a machine operator at each workstation. The productivity was always challenged as the process speeds of the different work centers varied so in the end the production rate was generally governed by the slowest operation. FICEP’s innovation to combine the drill with the saw or with a coper cut the typical shop space required in half. At the same time it reduced the number of operators typically required to one, and the challenge of trying to keep two work centers fully engaged was eliminated. 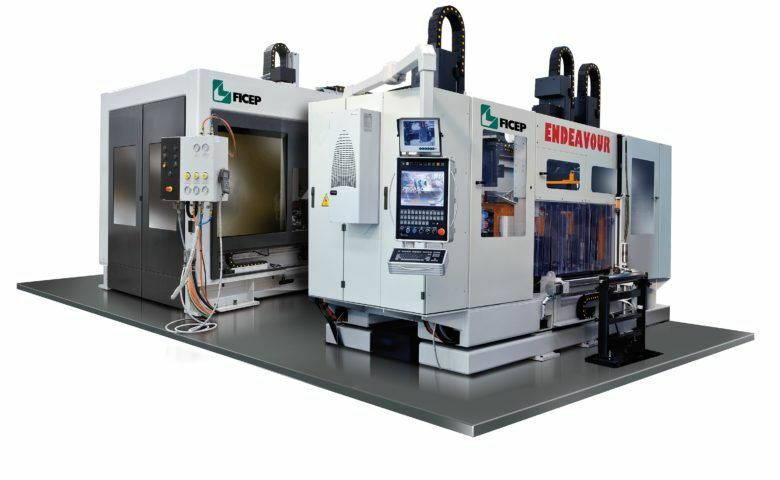 Regardless if the drill was combined with a saw or coper for thermal cuts, from the beginning FICEP developed a comprehensive CNC with multi-tasking capability to control the drill/saw or drill/coper with the same CNC control. 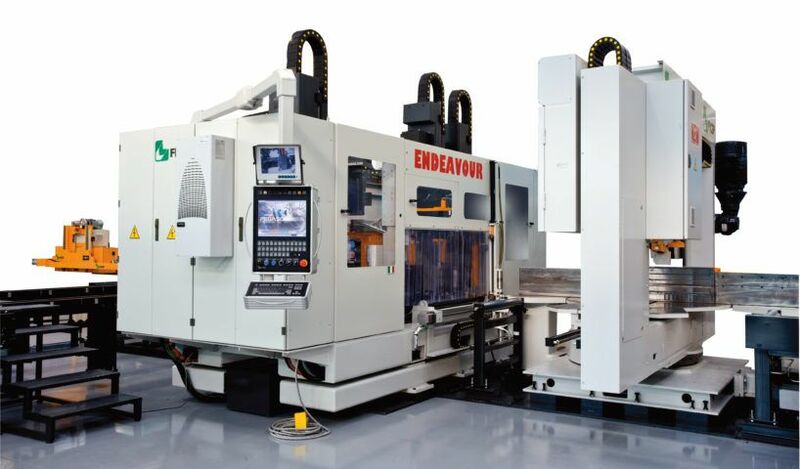 This technology enabled the two independent machines to operate as one fully synchronized production cell. In the case of the drill/saw, the multi-tasking capability of the system permitted drilling and sawing to occur simultaneously. For example, when the drill was making the final cut, the material positioning carriage could return, advance the next stock length and start the drilling process on the second length at the same time the saw is making its final cut on the first length. The software recognizes the position of the trailing end of first section and the leading end of the next stock length. It is like having to two trains on the same track but the one coming into the station holds back, if necessary, until the other train leaves the station. Today the tandem layout that FICEP introduced to the market probably represents 90% of the new layouts employed in markets around the world. This is just another example of how FICEP is driving innovation for our business partners so they can hone their competitive edge.